Team up with your friends and demolish the opposition with our handy guide. Our Fortnite: Battle Royale Duo guide contains tonnes of tips, tricks and strategy advice to help you win the game as a pair. Games are always better with friends and Fortnite: Battle Royale is certainly one of them. While playing solo is an intense, solitary affair, playing with a wingman in tow adds an extra fun dimension to the game. It’s all about jolly cooperation. Fighting, building and exploring the environment with someone else requires its own type of strategic nous that’s far removed from the solo, ‘every man for himself’ attitude. You’ll have to build for each other, survive fights together and make sure you’re equally geared up as you roam the map. So there’s a lot to think about when it comes to playing with a friend, and that’s where we’ve stepped in to help you out. 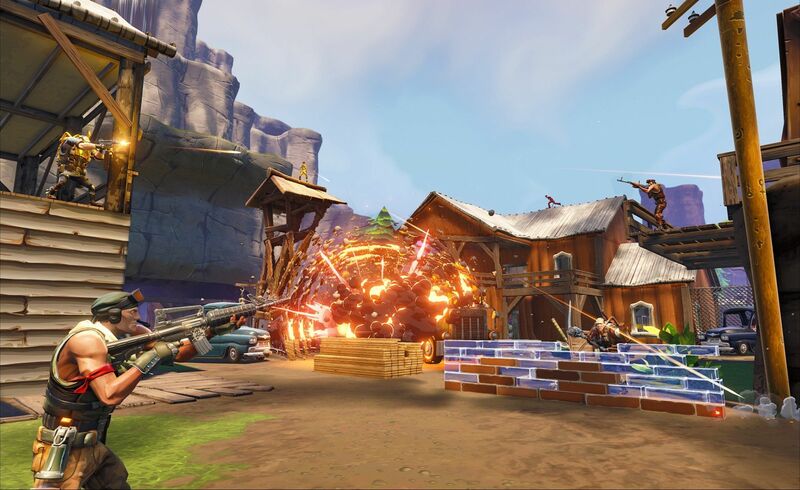 We’ve put together a few simple tips and tricks to help you dominate as a duo in all aspects of an average Fortnite: Battle Royale game - combat, building, looting and positioning. Editor's UPDATE #1: We've included a new section called "Sharing" right at the bottom of the page, as well as making sure that all our tips and tricks are up to date. Stay tuned for more! When you're done here, make sure you check out our main Fortnite: Battle Royale guide, our tips for gearing up and finding loot quickly, and even our guide to gettings the best performance out of your system! Here’s a few pieces of core advice that’ll elevate your game when buddying up. It’s important that you communicate which location you’d like to target. Focus on a particular building and aim to either head for the same spot and land together, or split up a little so you aren’t fighting over the same loot. So long as you’ve landed in the same vicinity, ensure you’ve said what supplies you’ve picked up, and call for back-up if there are any enemies in the area. It’s imperative that you act and react quickly when cracking open chests, or responding to a teammate’s plea for help. If you suddenly spot some enemies, or if you’re in a pinch - call it out. Remember, communication is absolutely vital when playing with an ally. Another common mistake is to be too descriptive when telling your ally where the enemy is located. Just keep it really simple: consult the compass, what direction are they heading? Anything of interest nearby? When you’re in the fight, it’s a good idea to try and spray down the same opponent. Call out which enemy you’re targeting and shoot them down. The same goes for structures too. Of course, you can’t prepare for every aspect of a fight, so it’s all about thinking together on the fly and working out the best course of action. If it makes more sense to flank, then have one of you sneak around the enemy. If it makes more sense to get the high-ground, build a structure together to overlook your opponent. It’s all about making the most of the fact you can coordinate as a duo. Always think about how you’d approach the situation now that there’s two of you. Finally, take into account that - more often than not - you’ll have to face two enemies. If you’ve knocked someone down, prepare to face their ally and be aware for any sneaky flanks they might be cooking up. We’re keeping this one short and sweet. If you know that you’ve got time, go for the revive. Be prepared, however, to ditch your mate if the situation’s looking dire and play for yourself from there. Happen to win the fight? That’s the time to check if you’ve got a moment to get your friend back on their feet. Before you go for the revive, it's also worth constructing a basic set of walls around yourselves. This'll provide some much needed protection from enemies either still in the area, or players who happen to be passing by. Make sure you’re both harvesting as many materials as you can. Whether that be chopping down trees when moving between points on the map, or gathering resources from fallen enemies. Again, communicate with each other when building forts and ensure you’re both on the same page. As long as you’ve both got enough resources to hand, you can build some pretty amazing structures! It’s also worth calling out how many materials you’ve got. This means that you’ve always got tabs on when you’re ally is running low so you can back them up if they suddenly run out. If you're not sure where to start with forts, take a look at our base building design ideas page. It'll have you knocking together basic shelters in no time. We recommend keeping a little distance between each other when looting, fighting and travelling. This’ll reduce the chance of you both getting taken out at the same time and open up greater opportunities to outmaneuver the enemy in the process. Being creative and flanking to your destination, or simply keeping a little distance between the pair of you, forces the enemy to face two separate threats instead of one. This is far tougher to handle and makes enemies more prone to making mistakes under pressure as well. Sharing is caring, so make sure you're helping out your teammates by topping them up with any excess stuff you've scavenged. Keep each other informed of how much ammo you're sporting and, crucially, how many healing items you've both got to hand. Your inventories are flexible, so don't hesitate to swap or share equipment if one of you isn't quite as well-looted as the other!